Over the past decade, the number of Earth observation satellites increased by several orders of magnitude and the spectral and spatial resolution of data they collect improved. Multispectral remote sensing technology is widely used in agriculture and is appropriate for vegetation analysis (Polder and van der Heijden 2001; Sabins 1997). Vegetation has characteristic spectra, often showing characteristic absorption maxima or minima at particular wavelengths. Most vegetation indices are based on the sharp increase in reflectance from vegetation that occurs around 700 nm (the red-edge), a change that is characteristic of green vegetation and not found for most other natural surfaces that show relatively slow changes of reflectance with wavelength over this region (Jones and Vaughan 2010). In particular since 2002, new opportunities for better data for calculations can be gained from the MODIS Aqua and Terra satellites, which provide free 36-band number, with 1 day repeating cycle and 250 to 500 m pixel size time series data sets. For agricultural water management today, remote sensing time series analysis (RS-TSA) is one of most important solutions for measuring agricultural droughts and its effects (Tamás et al. 2009). This case study supports filling the gap of knowledge in this field with the development of agricultural drought related decision parameters and its application in practice from raw spectral datasets. Signalling levels of this activity and free of charge available homogeneous remote sensing data (MODIS NDVI spectral indices) and land use (CORINE database) datasets can be applied in national and Central and Eastern European scales. The methods and databases explored include employment of remote sensing data on land use, as well as biomass production, soil characteristics for better integration and understanding of cropping patterns influenced by hydrology and soil types. Internationally available land use (CORINE database, topographic maps) remote sensing data, MODIS NDVI spectral indices, soil data (agro topographic map, soil water management properties, map of water management properties of soils), hydrology (soil water table), digital elevation models were processed and integrated to determine yield loss thresholds and soil water holding capacities. Remote Sensing toolbox includes the integration of land use, soil physical, meteorological and satellite data into a model, which can be a feasible tool for plant specific drought risk evaluation. Remote sensing data were calibrated by yield, and validated with other drought index data from European Drought Observatory. The geographical scope is regional and watershed scale. The study area was the lowland part of the Tisza River Basin, which is located in Central Europe (Hungary 29.4%, Slovakia 9.8%, Ukraine 8.1%, Romania 46.2%, and Serbia 6.5%) within the Carpathian Basin. Hydrologically the Carpathian Basin is one of the most closed basins on Earth and the investigated lowland has semi-arid to arid character. In this region there is intensive agricultural activity where the ratio of arable land is, for example in Hungary 72%. Surplus water and drought often occur in the same year or even in the same vegetation period. The World Meteorological Organization (WMO) and Global Water Partnership (GWP) have launched a joint Integrated Drought Management Programme (IDMP) in March 2013, to improve monitoring and prevention of one of the world’s greatest natural hazards. GWP is responding to the climate change challenge through a portfolio of programmes and projects aimed at building climate resilience through better water management (Kindler and Thalmeinerova 2012). In the frame of the Integrated Drought Management Programme in Central and Eastern Europe (IDMP CEE), this study focuses on identification of agricultural drought characteristics and elaborate and signaling agroinformatic method, which could result in appropriate early warning of droughts before irreversible yield loss occur. Among the different drought types the agricultural drought is the least quantified, thus the most uncertain drought type. Agricultural drought is influenced by several complex factors, whose measurements are complicated, time and resource intensive and their impact (such as yield loss) is either indirectly measurable or only measurable at a later date. Technologically, the broad application of remote sensing has few barriers, and remote sensing of crop biomass is one of the most important solutions for measuring agricultural droughts and its effects, although the cumulated knowledge on remote sensing can slowly be implemented into practice. While it is possible to continuously gather spectral physical data on plant water content, the direct interpretation of these data is not feasible practical for decision makers. Using field or other meteorological reference data for calibration of remotely sensed spectral data, real plant water demand can be quickly and effectively mapped in both space and time on the surface (Ji and Peters 2003). 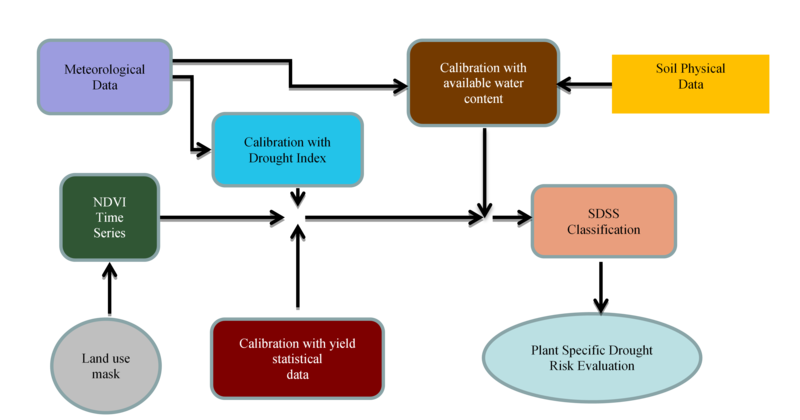 The main aim of the case study was to establish a decision support system for drought monitoring by concrete identification of remote sensing and GIS data tools for the development of Agricultural Drought Monitoring and Yield Loss Forecasting Method, which eventually provides information on implementation of drought risk levels. Define the integration of Remote Sensing and GIS tools and intervention levels for drought monitoring system to support decision makers. The case study has three important steps, which correspond and relate to each other in hierarchical way. Based on the amount of green and brown water, water balance analysis of a watershed concerning different land use, agricultural practice for each crop (wheat, corn and apple) from agricultural drought severity point of view are as follows: analysis of green water content at different soil terrain and climate (non irrigated circumstances and rain-fed) circumstances and analysis of brown water content at different soil terrain and climate (non irrigated circumstances and rain-fed) circumstances. Drought risk evaluation and mapping. Toolbox was elaborated for concrete identification of remote sensing and GIS data tools was also added for Agricultural Drought Monitoring and Yield Loss Forecasting Method, which eventually provides information on physical implementation of drought risk levels. 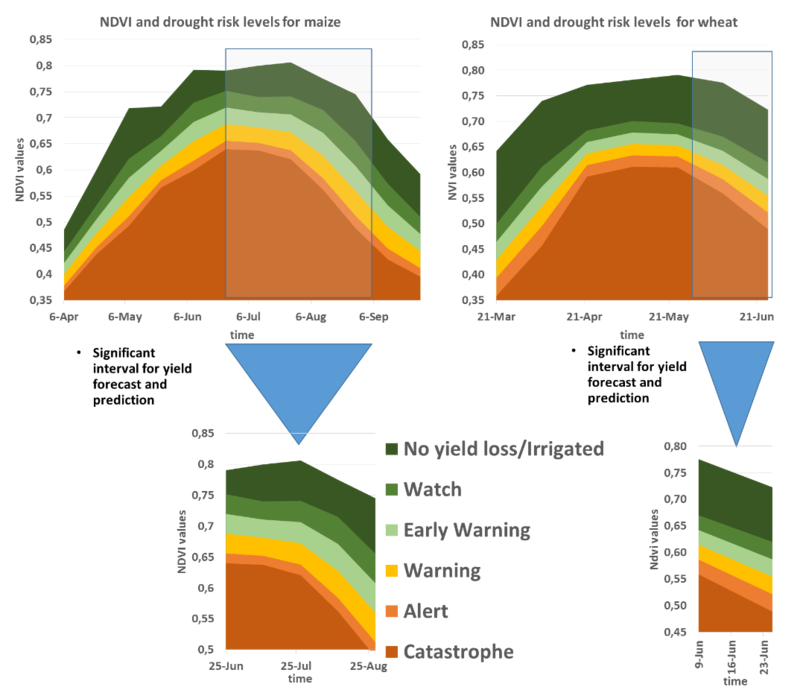 As a result, five drought risk levels were developed to identify the effect of drought on yields, such as: Watch, Early Warning, Warning, Alert and Catastrophe (Figure 2). A user-friendly drought monitoring and yield loss mapping process script was generated in order to make it possible for yield forecasting of other users in ArcGIS environment. The remote sensing based Agricultural Drought Monitoring and Yield Loss Forecasting Method can effectively indicate anomaly of droughts and yield losses and can identify the possible intervention areas. The methodology is also appropriate for early warning of droughts, since yield loss can be predicted 2 months before the irreversible yield loss and/or quality degradation realized. By plant specific calibrated yield loss maps the developed spatial decision supporting system gives precise information for farmers on drought risk of the different region. Thus decision makers can easily use it to estimate yield loss in a certain field. Such models and scripts were generated, which can be used by other users for other drought risk affected areas. This GIS models make it possible to access and share knowledge of drought monitoring and yield loss forecasting for users and stakeholders. Agricultural Drought Monitoring and Yield Loss Forecasting Method are also replicable for other countries, as it is based on utilization of NDVI. It is normalized data and the calibration of it is also based on normalized yield data sources. NDVI data and yield loss data from the whole Central and Eastern Europe can be easily compared. Since NDVI is strongly correlates to biomass, and biomass with yield; thus low NDVI means low biomass and low yield in countries. Furthermore the magnitude of the potential yield losses is connected to the five drought risk levels, which are applicable to other IDMP CEE countries. In case of average weather circumstance the optimal amount of corn and wheat yields (t/ha) have little difference in the region of Central and Eastern Europe. The extent of the drought can be transformed to exact amount of water, that is missing for an average yield (t/ha) from an area and should be utilized in a certain farm or a watershed. Both wheat and maize has it characteristic water demand unit for producing 1 ton of yield. Within the growing yield amount, the partial water utilization for production of 1 tonne of yield is decreasing. Based on this statement and a hyperbolic algorithm, the partial water usage of maize, wheat can be calculated. If the partial water usage is known, the absolute water usage and the ‘missing’ water amount can be easily calculated. Using Agricultural Drought Monitoring and Yield Loss Forecasting Method for the time series analysis those site can also be identified, where irrigation is often required. Combining these results and soil maps and the drought related soil moisture regime map those sites can be identified, where drought has regular effect, and possesses good soil characteristics, with large available water content capacity. It is important to irrigate primarily good soils, because the marginal utility of irrigation water is the highest in in fertile soil with optimal physical characteristics. If the sites are identified, digital terrain model, Landsat, and hydrological maps can be used to plan the water governance. Drought can have socio economic relations as well. The remote sensing based Agricultural Drought Monitoring and Yield Loss Forecasting Method can be used borderless, therefore the effect of a widespread drought phenomenon on yield loss can be assessed for a whole region. This information also facilitates the decision of which rural areas and its population suffers the most from the effect of yield loss. Since yield loss has negative effect not only on farmers but also on the whole agricultural sector, which can be influence the economy of regions and definitely the prices of wheat and maize based food, including animal nutrients, thus livestock prices). The results can also a basis of international joint control of stocks. Since stocks highly influence prices, mapping of yield losses of Central and Eastern European region can support to create joint export market strategy of the region and can give information in future stock problems. With agricultural drought monitoring and yield loss forecast method the yield loss of maize and wheat can be predicted 4-6 weeks before harvest and drought affected sites can be delineated more accurately. The impact of drought on agriculture can be diagnosed far in advance of harvest, which is the most vital need for stakeholders concerning food security and trade. This information can facilitate drought intervention activities that reduce impacts of drought on possible stock uncertainty and can support decision makers in more accurate mitigation measures and preparedness plans for a specific region. The results of Agricultural Drought Monitoring and Yield Loss Forecasting Method provide a complete observation of drought and spatially dense observation of crop growth. This complements the information on daily weather parameters that influence crop growth. Agricultural drought monitoring signalling and intervention levels is a convenient vehicle to capture our understanding of yield loss with GIS providing a framework to process the diverse geographically linked data. Currently agricultural drought monitoring, signalling and intervention levels can regularly provide information on regional crop distribution, and yield loss. This can be coupled with crop simulation models in a number of ways. These include: a) direct use of MODIS NDVI as forcing variable; b) re-initializing or re-calibrating MODIS NDVI by yield data; and c) using yield calibrated NDVI to estimate thresholds for drought (yield loss) categories and final using MODIS NDVI and thresholds in mapping of yield loss forecast. These results are the basis of state aid, and any possible determination of compensation. To counteract the decision makers’ tendency to delay a response until there is hard evidence of a crisis, ignoring genuine Agricultural Drought Monitoring and Yield Loss Forecasting Method. Yield loss can be calculated 1.5-2 months before harvesting. Although drought and water stress are not the only factors that can cause a decrease of yield. This is the weakness of this method, since it cannot take the difference between NDVI changes caused by drought or other factors. Change in land covers or pests and diseases can also be responsible for such variation of the yield loss. Therefore this method must be used jointly with other data giving information on the deficit of rainfall/soil moisture in order to determine if the variation in the vegetation response (signal) is linked with a drought event or not. The authors acknowledge that the research work was funded by the joint Integrated Drought Management Programme of the Global Water Partnership and the World Meteorological Organization in 2013-2014. Ji, L. and Peters, A.J. 2003. Assessing vegetation response to drought in the northern Great Plains using vegetation and drought indices. Remote Sensing of Environment 87: 85–98. Jones, H.G. and Vaughan, R.A. (2010): Remote sensing of vegetation. Principles. Techniques, and applications. Oxford University Press, New York, 353. Kindler, J. and Thalmeinerova, D. 2012. Inception report for the GWP CEE part of the WMO/GWP Integrated Drought Management Programme. Global Water Partnership Central and Eastern Europe, Slovakia, 83. Polder, G., van der Heijden, G. W. A. M. (2001): Multispectral and hyperspectral image acquisition and processing. In: Proceedings of SPIE. Eds. : Q. Tong, Y. Zhu and Z. Zhu, 4548. Sabins, F. F. (1997): Remote Sensing - Principles and Interpretation, 3rd ed., W.H. Freeman, New York, NY. Tamás, J. and Bozán, Cs. 2009. Biomass productivity on the Békés- Csanád loess plateau. Cereal Research Communications. 37 (4): 505-508.